This supine yoga practice is great on days when you might be stuck in bed! The gentle stretches recirculate prana (life-force energy) through the body which revitalizes the muscles and helps us to feel more energized This practice is also very grounding, so if an anxious mind is contributing to your fatigue, these poses may help. 1️⃣ Half Happy Baby Pose: This easy variation stretches the inner thighs/groin and moves energy through the hips and sacral chakra. If holding the foot doesn’t feel good, you can hug your arm behind the knee instead. Hold for ten deep breaths. Be sure to practice on both sides! 2️⃣ Legs Up the Wall Pose: This pose is good for pretty much everything! It revitalizes tired legs, balances blood pressure, stretches the hamstrings and soothes headaches. You can hold the backs of the legs for support or practice against a wall. Hold for up to ten minutes. 3️⃣ Reclining Bound Angle Pose: This pose benefits the digestive system, moves energy through the pelvis and sacral chakra. Adding pillows or folded blankets under the knees can make this pose more comfortable and restorative. Hold for up to ten minutes. 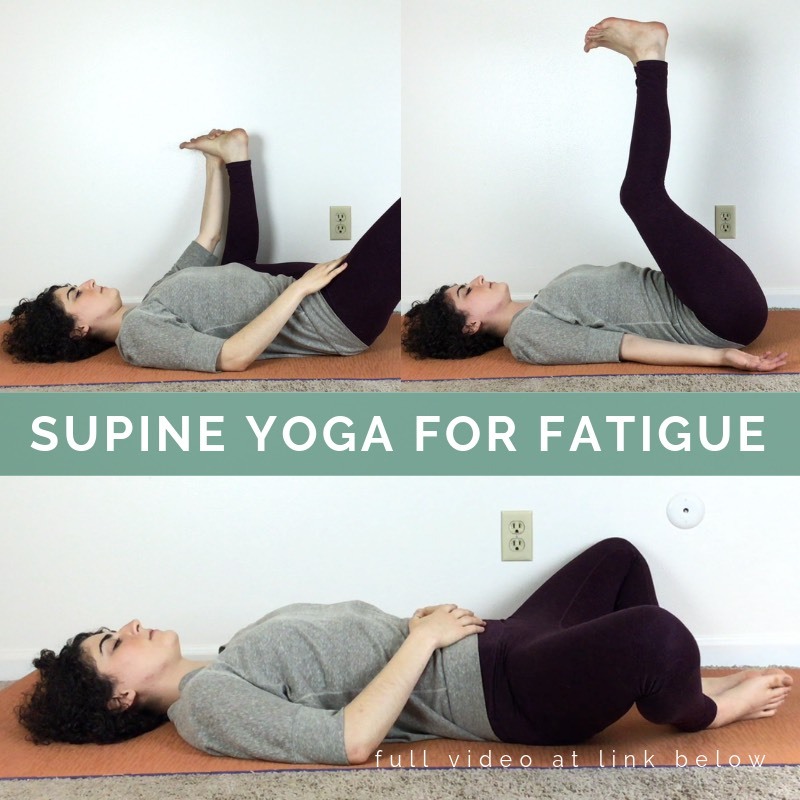 The full Supine Yoga for Fatigue class is included with your Spoonie Yoga Tribe membership! You can access the full video here.